An architect of modern India, Sardar Patel remained somehow a neglected personality in the contemporary echelons of the greats. He was a Gandhian-resolute, straightforward, pragmatic and a visionary. He was not only a freedom activist, but a deft policy-maker who was responsible in navigating the All India Congress from just a podium of mass movement to that of a party representing the political ethos of the nation through resounding victories in electoral politics. In independent India, he established himself as one of the foremost leaders, ready to guide the newly formed nation to its heights. Along with Nehru, they formed the ideal, but difficult duo destined to take the nation to the pinnacle. Sardar, by that time had already earned the popular epithet of the 'The Iron Man'. And true to it, he, within a span of two years of his office as Home Minister succeeded in the Himalayan task of uniting the 560 plus princely states into the union of India. Thus, he Was instrumental in giving birth to the Republic of India. This book maps his rise through the multiple phases of a grass root organizer, a freedom fighter, a Mass leader, a craftsman of electoral politics, an insightful planner and the maker of modern India. Well-documented and researched in self-contained chapters, the writer has incisively argued out the reasons which pushed this charismatic karma yogi into cold storage. The reader will go through an exciting journey to discover how a villain is created out of a hero. Yet, posterity has showered the much-denied accolades in making him the Bharat Ratna. P.N. Chopra was the Editor of the Indian Gazetteers, Chief Editor of Who's Who of Indian Martyrs in the Ministry of Education and Chief Editor of the 'Towards Freedom' Project. He has to his credit over forty authoritative works dealing with Indian history and culture, particularly the history of India's freedom struggle. He has also edited the fifteen-volume series, The Collected Works of Sardar Vallabhbhai Patel. Sardar Vallabhbhai Patel, along with Gandhiji and Jawaharlal Nehru, remains one of the foremost leaders of India. This Triumvirate was mainly responsible for giving shape to the destiny of the country during the freedom struggle and in the early years after the achievement of independence. Gandhiji inspired his countrymen for the independence of the country, Nehru formulated his foreign policy and Sardar Patel unified the country into one united whole in a splendid manner. A man of iron will Sardar Patel dealt with the complex question of 560 odd princely States in a masterly manner. Almost within a year, he redrew the map of India with every such State joining the Indian Union and forming a part of the political and cultural life of the mainstream. Even if the Sardar had not done anything else other than this unification of the country, his name would have been written in letters of gold in Indian history. In 1956, Nikita Kruschev, during his visit to India as General Secretary of the CPSU along with the then Soviet Prime Minister Nikolai Bulganin, expressed his admiration for Sardar Patel's statesmanship and rated it higher than Chancellor Bismarck's unification of Germany! He said, "You Indians are a remarkable people. How did you manage to liquidate the princely States without liquidating the Princes?" It is amazing indeed that though the Sardar took away almost everything from the princes, the princes never complained of any injustice. H.Y. Hodson, in his Great Divide, quotes Mountbatten as saying, "I am glad to say that Nehru has not been put in charge of the new States Department which would have wrecked everything. Patel, who is essentially a realist, is very sensible in going to take it over." "That there is today an India to think and talk about," President Rajendra Prasad wrote in May 1959, "is very largely due to Sardar Patel's statesmanship and firm administration." "Yet," added Rajendra Prasad, "we are apt to ignore him." If forgotten, Sardar Patel is also greatly missed. Troubled times clamour for a firm grip on India's affairs which the Sardar had. How he acquired that grip is a part of the Patel story. It is, however, tragic, that the rulers have shied away from giving the Sardar his rightful place. The conferring of the Bharat Ratna award on him thirty-five years after its institution reflects the criminal negligence of the rulers to his great contribution. It is a pity that Sardar Patel remains a much misunderstood man, thanks to the lobby of his political rivals who consistently carried out a campaign of vilification against him, by distorting facts. 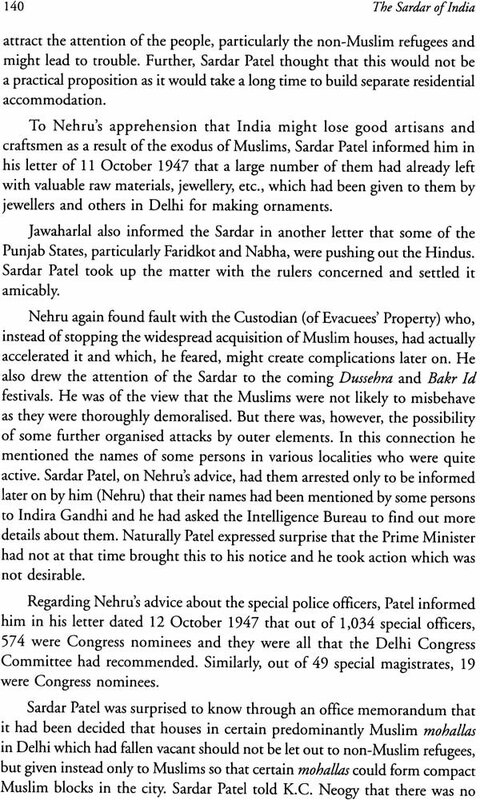 The socialists who looked upon Nehru as their hero were in the forefront to besmear his fair name and tarnish his image as a supporter of the capitalists. They even branded him a reactionary but fortunately they were the first to realise how wrong they had been in their judgment. 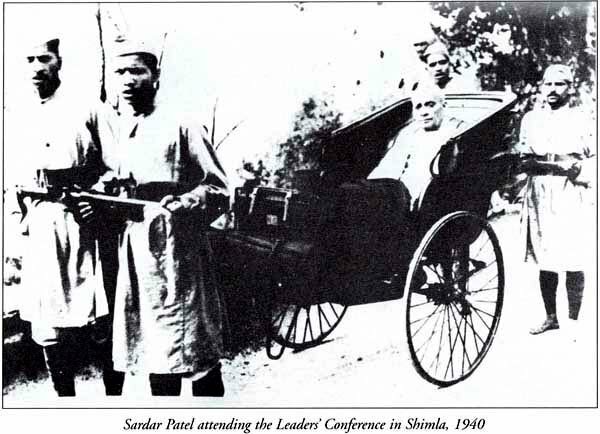 In fact, Sardar Patel had made it clear to the socialists as early as 1934 that he had no dispute whatsoever with socialism or the Congress Socialist Party, and if they had any radical programme to implement he would be too willing to join hands with them. However, the Sardar categorically stated that a borrowed methodology of socialism had been misused to establish fascism. The Sardar has been portrayed by his rivals as an inveterate foe of Muslims. Blunt and quite outspoken, he refused to mince words. He was an avowed Hindu like Gandhiji but unlike his mentor he never prayed regularly and seldom visited temples. He believed more in deed than in ritualism. His speeches show how firmly he stood for Hindu-Muslim unity, and he enjoyed the unstinted support of the Muslims since the time of Bardoli Satyagraha, when his most trusted lieutenants were Abbas Tyabji and Imam Saheb. 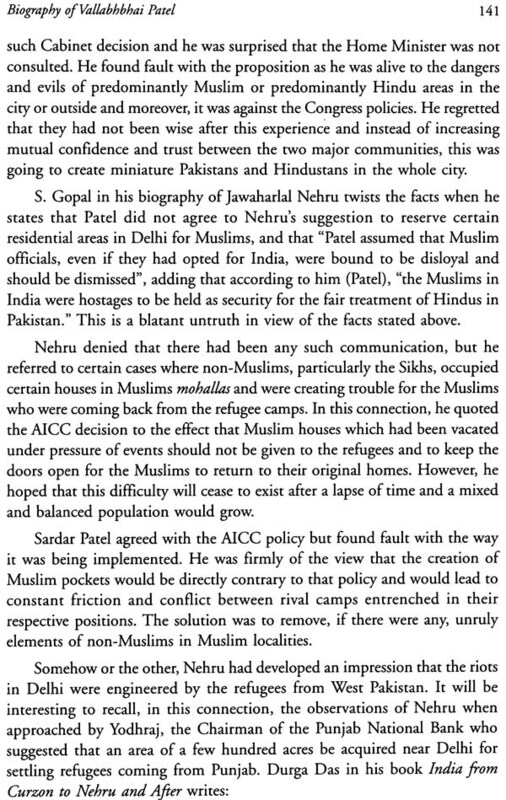 Even when a newspaper correspondent cast aspersions on Sardar Patel for his pronounced pro-Hindu bias, that apostle of Hindu-Muslim unity, Gandhiji rebuked him and said that though the Sardar's method and manner of approach to the Hindu-Muslim question might be different, "it would be a travesty of truth to describe it as anti-Muslim. The Sardar's heart is expansive enough ... " In fact, the Sardar's speech at Aligarh Muslim University immediately after independence bears out his stand on the Hindu-Muslim question. 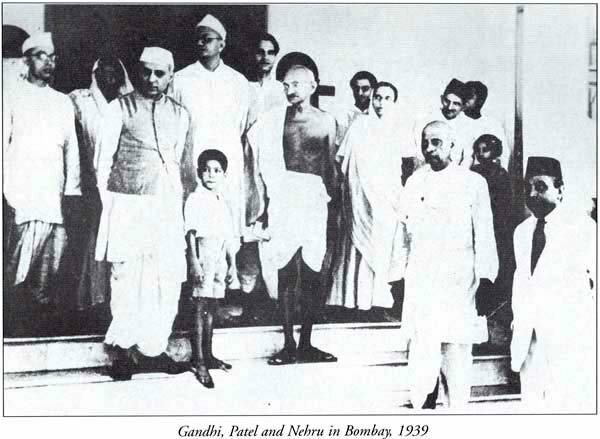 Much has been made of the conflicts between Nehru and Patel by men representing vested interests, deliberately ignoring their mutual regard and affection for each other, of which the best testimony are the letters which they exchanged after Bapu's assassination, and their close comradeship for about quarter of a century under the leadership of Gandhiji in the struggle for freedom, and later on in the building up of the unity of the great India of their dreams. 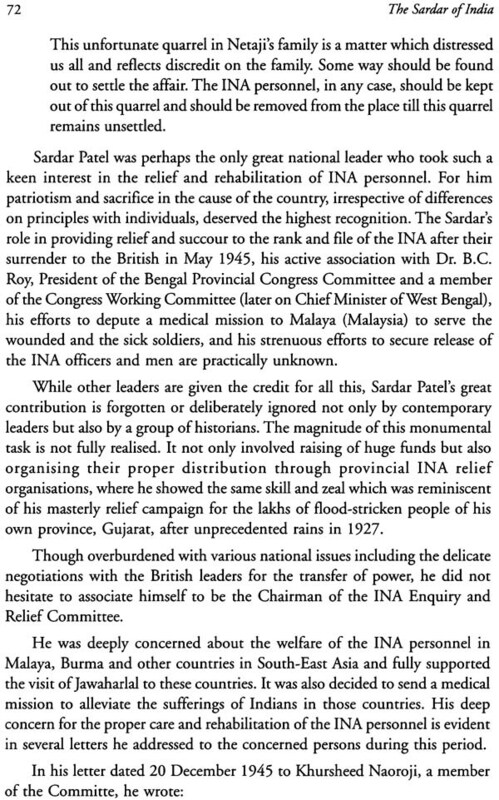 The Sardar always showed much magnanimity and gave due Respect to Nehru as the Prime Minister and in fact helped him resolve some of the crucial problems facing the country. 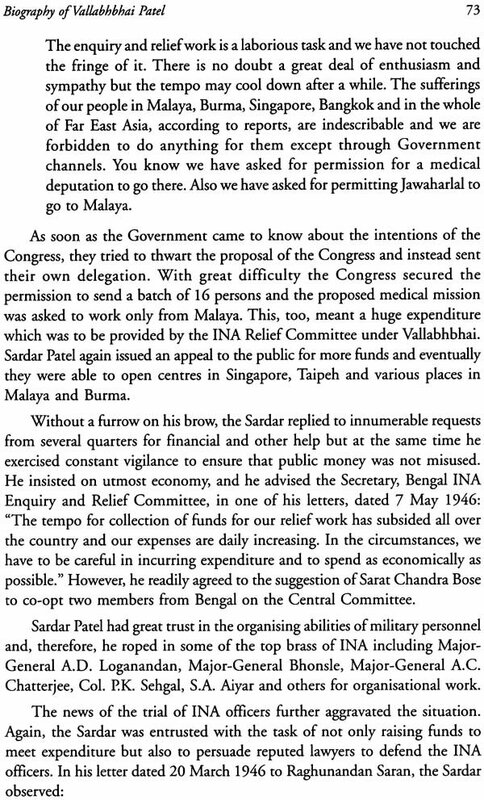 He came to Nehru's rescue when the need arose, as for example, in case of the unrest in Bengal, the Nehru- Liaqat Pact, the piloting of the controversial bill, giving a special status to Kashmir, in the absence of the Prime Minister who was then abroad, in spite of his personal reservations. He lent a helping hand even in the framing of the foreign policy, and to him goes the credit of persuading Nehru who was opposed to the idea, to agree to be a member of the Commonwealth. 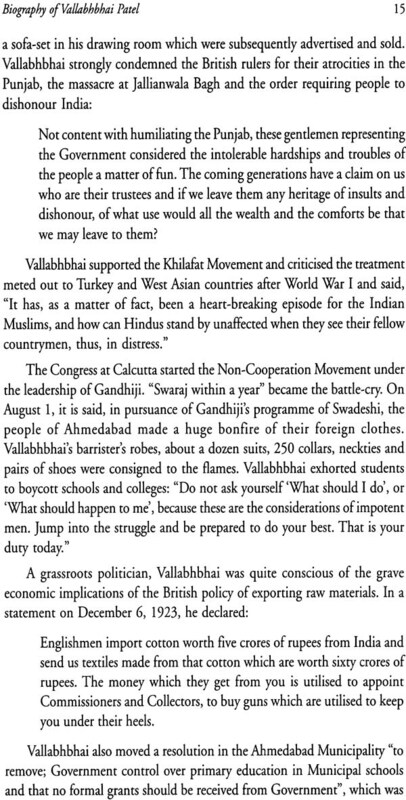 Patel was the first statesman to foresee the threat from China, and warned Nehru of China's sinister designs. Unfortunately, some self-seekers to whom the Sardar had made a reference in his letters tried to create a rift between Nehru and Patel, bur still they managed to pull on in the larger interests of the country. Because of this great hold on the Congress organisation, the Sardar was much more powerful and could have easily voted our Nehru, bur he was contented enough to be second in command in deference to Bapu's wishes and for the welfare of the nation. Rugged in appearance and indifferent to his dress, the Sardar looked an alien among the sophisticated group of Fabians that included the Nehrus, C.R. Das and such other scions of aristocratic families. He was more akin to such less aristocratic mortals as Rajendra Prasad, Purshottamdas Tandon, G.B. Pant, and others who were born and brought up in humbler surroundings and belonged to the peasantry and spent their early lives among the village-folk, away from the sophisticated urban class. 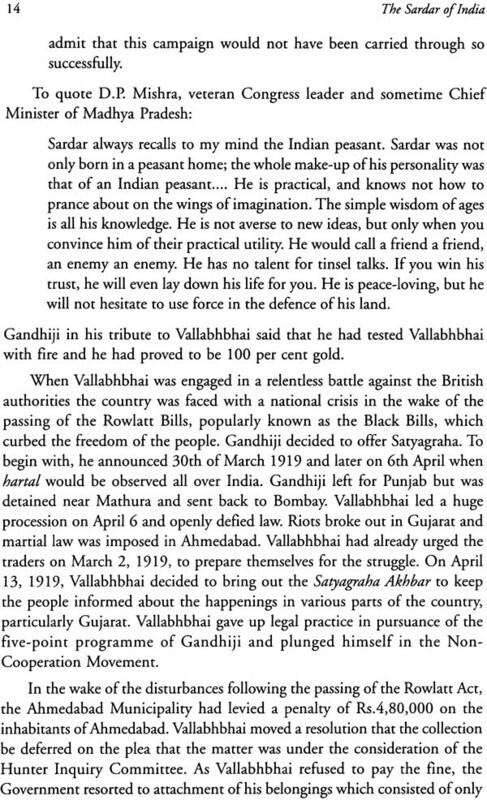 Gandhiji was perhaps one of those few persons who understood the great Sardar, and showered praises on him whenever he could. If the Sardar did not come to occupy the highest office of the country, the blame squarely lies with his mentor, whose blind follower the Sardar was. However, history is no respector of persons, and as the years pass by, the Sardar's friends and foes alike have come to realise his greatness and practical sagacity with which he solved the problems which the- country faced before and after independence. India's shrewd statesman, C. Rajagopalachari, twenty-five years after the selection of India's first Prime Minister, recalled the event and wrote: "Undoubtedly it would have been better if Nehru had been asked to be the Foreign Minister, and Sardar Patel made the Prime Minister." Had he lived longer and had he occupied the position which he rightly deserved, perhaps there would not have been such big problems as those of Kashmir, Tibet, China, and even religious conflicts. In the economic sphere too, the liberalisation policy which is being introduced today with great fanfare in place of the Nehruvian economic policies largely based on the Soviet system would have long been introduced with proper planning. The following work is not a biography only in the technical sense of the term; all important events connected with and concerning the Sardar's life have been dealt with. An attempt has been made to put the record straight on the basis of authoritative documentary evidence so that posterity may judge the Sardar and his contribution in the proper historical perspective. My association with the project, The Collected Works of Sardar Vallabhbhai Patel, undertaken since 1988, gave me access to the original documents both in Gujarati and Marathi, contemporary newspapers, archival material available in the Sardar Patel Museum in Ahmedabad, as well as records in the custody of Maharashtra and Baroda State Archives, Nehru Memorial Museum and Library and the National Archives of India. I am grateful to Shri S. Nijalingappa, Chairman of Sardar Patel Society, for his sustained encouragement in my pursuit of this project, and to my wife Dr. Prabha Chopra for her unstinted support and valuable suggestions. I am obliged to Prof Y.N. Datta, my esteemed friend, and Dr. Hari Dev Sharma, Deputy Director Nehru Memorial Museum and Library, for their keen interest in this work. My thanks are also due to my colleagues Shri B.R. Ajmani and Shri Sanjay Mukherjee. I should also like to express my thanks to Shri S. Banerjee and Shri B.R. Bowry of Allied Publishers for seeing the book through the press.